They may be short in stature, but this subterranean race of magical inventors are intellectual giants. These incredibly intelligent beings use their knowledge and skill with magic and crafting to assert their natural dominance. In the world of the asura, it is not the strong who survive, but the clever. Other races believe they should rule by virtue of their power and strength, but they delude themselves. All will serve the asura - in due time. Driven to the surface of Tyria by minions of Primordus, the Fire Dragon, the asura have created a complex new society based in vast Maguuma Jungle metropolises like the awe-inspiring Rata Sum. Asura life is based around the study of the Eternal Alchemy, an all-encompassing metaphysical theory that they analyze in their great research institutions - the College of Statics, Dynamics, and Synergetics. 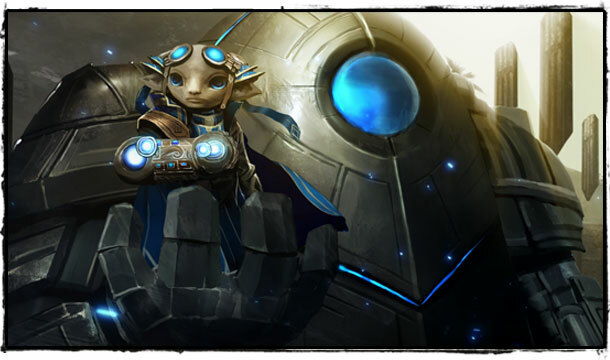 Asura use their magical skill to create servitor golems, asura gates, blasting rods, and other magnificent inventions. Their culture is organized, but highly flexible--these small geniuses often gather in specialized work groups called "krewes" to accomplish greater tasks. Asura establish their reputations with their peers by building a portfolio of successful projects or by becoming the foremost expert on some arcane field of study. They constantly seek to prove their own intellectual superiority, and by extension the superiority of the asura race. Who are more fit to rule Tyria than the asura? The more primitive, warlike races can be useful when an asura needs something heavy lifted, but they mistakenly believe that brute force or resiliency entitles them to power. How mistaken they are. As any asura will explain, mastery of the Eternal Alchemy equals mastery of Tyria. Who can argue with such logic?